As a mom of six kids, I definitely run a busy household. And when back-to-school season is upon us, I have to be good at dealing with the stress and anxiety of getting everyone ready and out the door on time in the morning. 1. Help your kids help themselves. Rather than wasting time nagging my kids to pack their homework or lunch, etc. I give them the tools and encouragement needed to think for themselves. At our house, my little ones use the ‘Ready, Set, Go’ Board to manage their morning routines. Every child marks off duties as they’re completed – get dressed, go to the bathroom, eat breakfast, brush teeth, etc. And if each is done without verbal reminders, they earn a check mark in my wonderful and elaborate reward system. This visual cue is very helpful for children, and non-readers can do it just as well with the use of pictures. 2. Make sure everything has a home. Each of my children has a cubby for their agendas and homework. Since there’s nothing worse than running around in the morning trying to find gym shoes or school forms, I avoid the chaos by designating a location for all school and lunch gear. 3. Don’t let children make choices in the morning. I know this sounds harsh, but if you start asking everyone what they want for breakfast, you’ll soon turn into a short-order cook. Serve one breakfast item to all. Keep it simple – go with cereal and fruit if you can get away with it. I freeze sandwiches to use throughout the week, or make casseroles and soups on the weekend to throw in a Thermos when the colder weather hits. 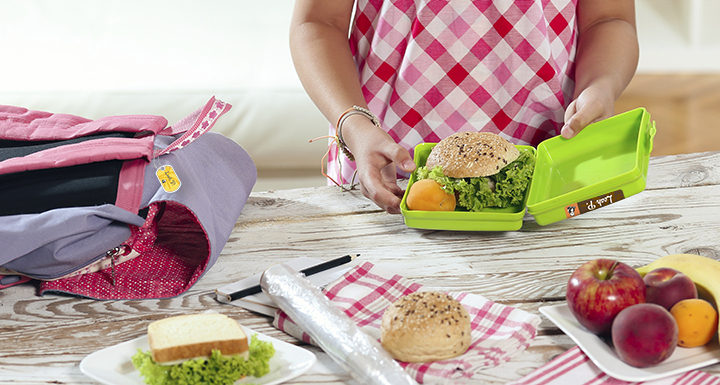 If you have a child with allergies, be sure to place an Allergy Alert label on all of their reusable lunch containers to remind caregivers and lunch buddies. Having to get your littlest ones out the door every morning so you can get your bigger kids on the bus can add a lot more time and stress to your morning, especially in wintry weather. I hire an older kid who goes to the same bus stop and is happy to do the morning pick-up and afternoon drop-off for a cool $20 a week. “Bus buddies” are a terrific investment for busy mamas. If you or your kids have ever found yourselves puzzling over identical looking clothes or uniforms, you’ll know what a time-saver labelling can be. Use waterproof labels (like Mabel’s Labels) on clothes, shoes, bags and school supplies to let everyone know who owns what, and you’ll get out the door much quicker. Best of all, labelling will keep stuff out of the lost and found, saving the time, cost and hassle associated with having to re-buy items. With a little patience, organization and a master plan, mornings can be smooth sailing all school year long! Julie Cole is a mom of six, as well as co-founder and company spokeswoman for Mabel’s Labels – the leading provider of labels for the stuff kids lose!